On Saturday, 14 May 2016, the Knights of Columbus Woodlawn Council 2161 Traditional Latin Mass Guild hosted the 2016 Blue Mass at St. Titus Church in Aliquippa, Pennsylvania, to honor police and law enforcement officers in Beaver County, and to invoke God's blessing and protection upon them. Prior to Mass, and before the assembled faithful, Reverend Father Ladis J. Cizik blessed police vehicles on Franklin Avenue in front of St. Titus Church. 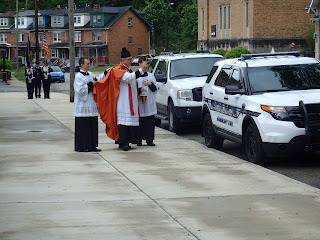 Posting the colors before Mass. Fr. Cizik offered the Mass for the Vigil of Pentecost. Fr. 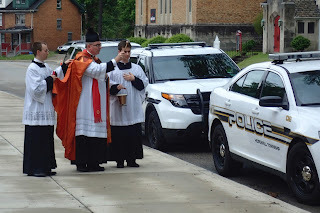 Cizik preached the sermon: 2016 Blue Mass: The Color is Red. After Mass there was a luncheon in the church hall. Senior Magisterial District Judge James F. DiBenedetto served as master of ceremonies. Prior to the featured speaker, several government officials addressed those gathered for the luncheon. The featured speaker was Monaca Police Officer David Piuri, President of Beaver Valley Lodge #4 Fraternal Order of Police. Sate Senator Elder Vogel, Jr.
St. Frances Cabrini Parish, Center Twp. Beaver Valley Chiefs of Police Assoc. Housing Authority of Beaver Co.